The 1960s reflects an important era, when Singapore gained her independence, and the decade was labelled the “Swinging Sixties” for the rise of popular culture, flamboyance and individual expressions. 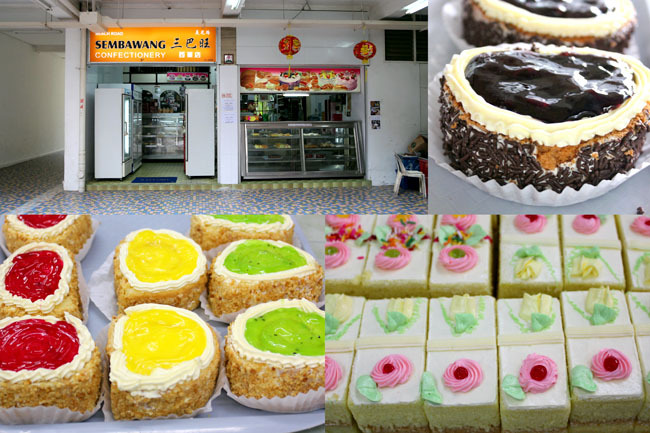 I decided to take a blogging trip back to the past, to document 5 old-school cake shops in Singapore that survived the test of time through the 60s, most of which were established in that era. From Clementi to Tiong Bahru to Bedok, these shops are still making cakes the traditional and difficult way – by hand. So why cakes? 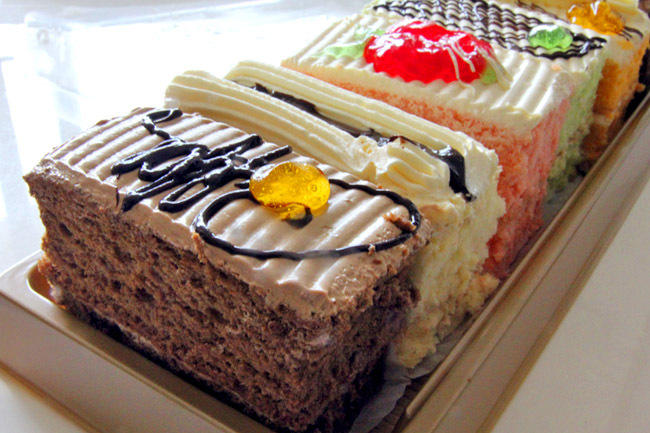 Simply because cakes evoke the most memories in me. I grew up making many cakes and kuehs with my ah-ma. We would spend hours kneading, delicately wrapping them, and giving them away to relatives. (We kept the burnt ones within our family.) Those were the times when we truly bonded and spent wonderful times together. Neighbours would reciprocate by giving their own recipes and creations. I don’t really see much of that happening anymore. Even if the modern confectionaries claim they sell traditional goodies, they are just not the same. 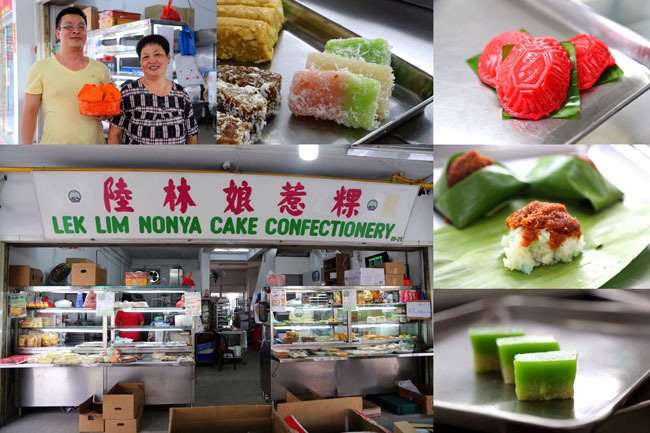 Lek Lim Nonya Cake Confectionery, located at Bedok North, started back in 1967 in a simple kampong kitchen at Changi Village. Although the family is Teochew, owner Madam Sing learnt the skills of nonya cake making from her father’s Peranakan ‘shi-fu’. While she was initially happy making kueh for the kampong, her ‘Ang Ku Kueh‘ (red tortoise cake) became too popular in the 1980s precisely because Singapore had a baby boom, and many families ordered that as first month cakes for the newly born to symbolise blessings. She eventually opened her official shop in 1987 which, until today, has remained at the same location. 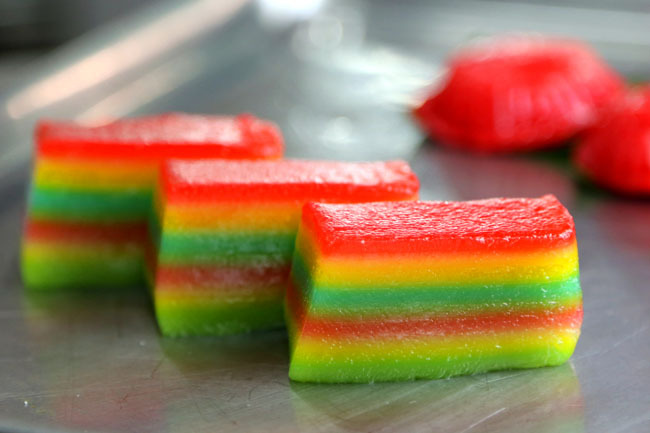 The shop’s pride and joy is the ‘Jiu Ceng Gao‘, otherwise known as Kueh Lapis Sagu or Nine-Layered Cake ($1.40 each). I enjoyed eating this kueh layer by layer, and Lek Lim’s version made from tapioca flour, coconut milk, and flavoured with pandan is indeed aromatic, smoothly delicate and not too sweet. I did notice their version had ten layers, instead of the usual nine. Madam Sing explained that the traditional types would have white as a base, green (added by the Malays), red (added by the Peranakans) and a choice colour which distinguished the different families. She wanted to be different and added both blue and yellow because she fell in love with the colours of the butterfly flower. Blk 84 Bedok North Street 4 #01-21, Singapore 460084 (Near Feng Shan Food Centre, Tanah Merah MRT, take bus no 14, 4 bus stops). Le Café’s lady boss Betty, still clothed in a 60s style of sleeveless dress and orange spectacles, is proud that heavenly king Andy Lau had once ordered his Golden Horse awards celebration cake from her – and it was Le Cafe’s signature black forest cake. Le Café was established in 1949, and has been in same the Middle Road location for 60 odds years. But few would know they started off as a zhi char shop, and started selling cakes in the 60s when ‘Guo Da Li‘ (betrothal gift exchange) cakes became widely sought after. These ‘Guo Da Li’ cakes were traditionally given to the bride’s family two weeks before the wedding to be distributed to friends and relatives together with the invitation card. 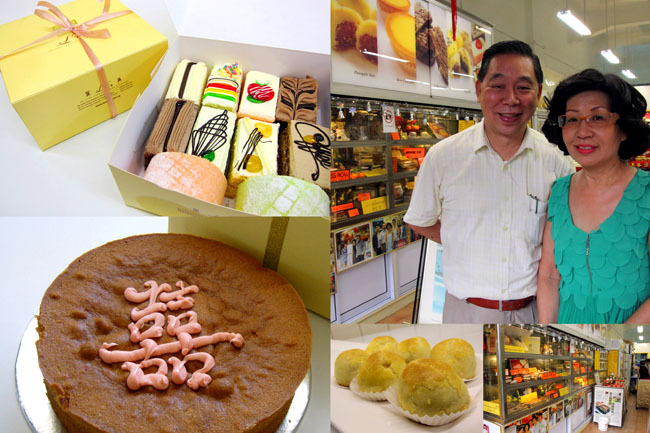 Even though Le Café’s pineapple balls and beancurd tarts have become extremely popular, they still continue to make these retro-licious Butter Cream Cakes ($7 for a box of 6) in their kitchen behind because they do not want to lose their traditions to modern day fads. While there are butter cakes sold in many places, few taste as old-school as Le Café’s. Sembawang Confectionery was first set up in Katong back in 1962, then at Thomson Road and was well-liked for its chicken pies, curry puffs and sausage rolls. However, popularity of these items went down due to the widespread opening of modern bread shops. Even then, the owner refused to be stingy on ingredients, while insisting on keeping prices low. He shared three formulas to keep his customers loyal: Use quality ingredients; make good food; and sell them cheaper than others. Its present location at Beach Road would zap you into a time machine back to the past, with its tiled flooring, red lanterns and sale of old-school cakes. 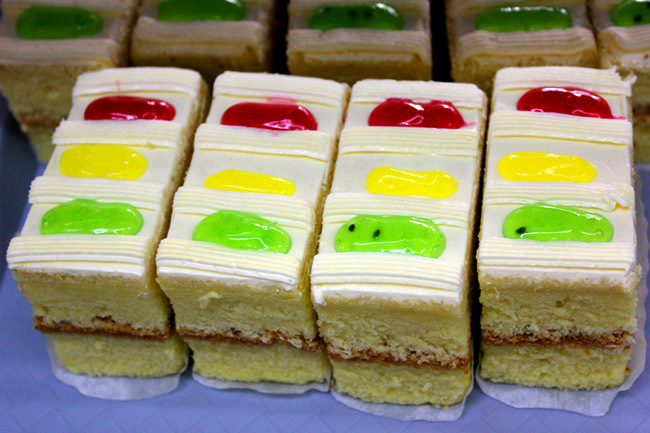 Of course I was surprised to find the Traffic Light Cake ($1.20). I haven’t seen these since I left primary school. They are still soft and fluffy on the sponge, and thick and creamy on its top layer, exactly how I remember it used to taste like. When asked the year Tiong Bahru Galicier was founded, owner Jenny Soh looked a little stunned (as if nobody ever asked that question before), “Before the world war, before I was born!” and laughed. She still had a photo dated 1975 of her old shop located at Orchard Road, and said she would have been a very rich woman had her shop not made way for the shopping centres. 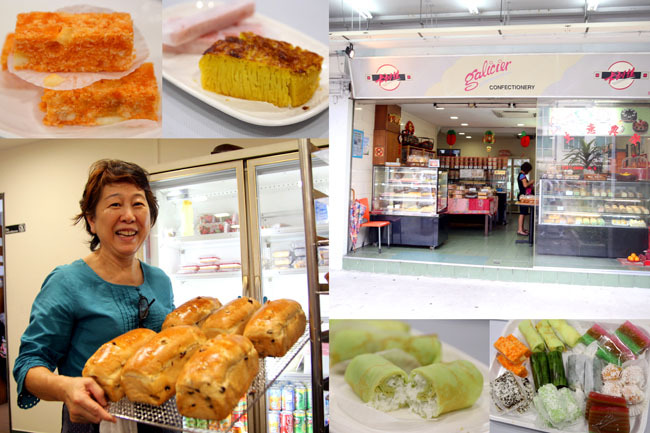 Fans of nonya cakes have to be careful stepping into Tiong Bahru Galicier. It sells so many old-fashioned kueh you would feel like buying the entire shop! Getting to know their products is an excellent food history lesson! Their variety include the orange Pandan Tapioca Cake (60 cents), Ondeh Ondeh (60 cents), Kueh Kosoi (70 cents), Kueh Ambon honeycomb cake ($1.20) and Kueh Salat (90 cents). 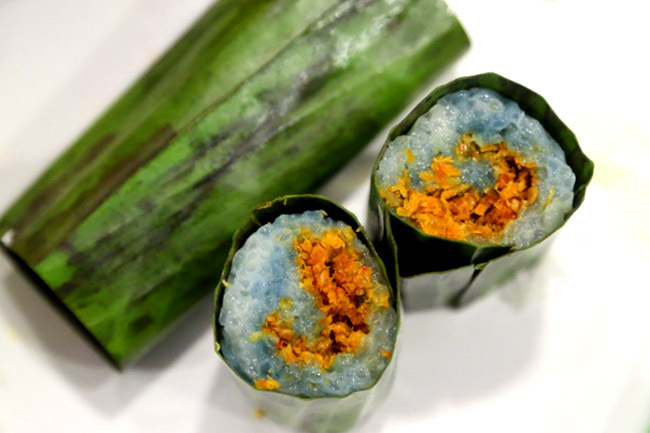 I must confess that I had never seen or tried a Lemper Udang ($1.20) until recently – a glutinous rice roll filled with spicy dried shrimp wrapped in a banana leaf. This is like nonya sushi meets bak zhang, and is so yummy being savoury and sweet at the same time. While Singapore gained her independence in 1965, Balmoral Bakery opened in December the same year, founded by Hainanese ‘Ah Kohs’ (big brothers) as a complement to the famed Balmoral Steak House at Holland Village which was frequented by the British armed forces. The owner then loved all things English, named his shop after a castle in Scotland, and sold English treats such as butter cake, rum balls and beef pies. Balmoral’s pastry chef picked up his baking skills at the cake section of Robinson’s Department Store, which was destroyed by fire in 1972. They moved to the current location at Sunset Way in 1984, and continued making items the way they were taught, to ensure quality and tastiness. During my visit, the shop seemed to be frequented by customers in their 40s and 50s, perhaps there to buy a piece of memory. 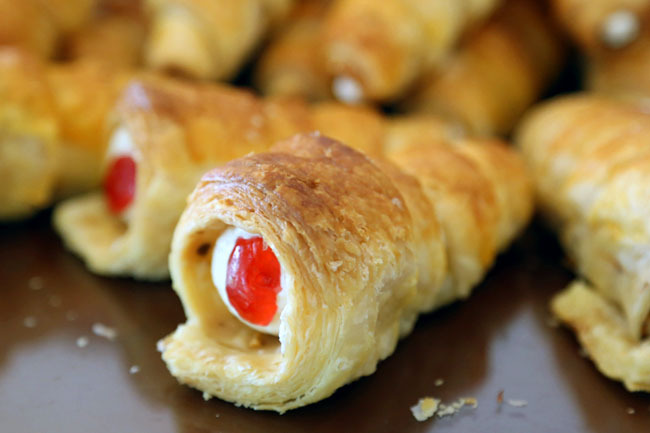 Not many bakeries now sell the Cream Horn ($1.40 each), puff pastries filled with rich buttercream. I bought 3 Beef Pies ($2.00 each) back home, and it has been a long while since my mum would take the effort to walk into my room and tell me “That pie you bought is delicious!”. I took a bite, and was astonished by the crusty golden outer layer, and flavoursome fillings. I can fully believe that pies made by hand are truly the best. Reflection: It was a moving educational trip for me, to learn about the history of food, and how these shops have survived through the ages. Two things I have learnt from these cake shops in the 60s: Resilience and Optimism. Despite all the competition they are facing, despite the temptation to use technology and cheaper ingredients to make their cakes, they still insist on sticking by their guts and practices. The one person they couldn’t bear to cheat – the customer. The owners just continue to serve and give the best they could, and this sense of resilience is something I really respect them for. Many of these shops are facing the same problems others are facing: high rental and the lack of people taking over. The owners continue to remain optimistic about the future, as long as customers continue to appreciate their cakes. Cakes are indeed a happy food. One thing I feel relieved to see is that over at Lek Lim and Le Café, the children are back in the kitchen doing the baking with their parents, also updating their websites and seem ready to take over the business. At least I know that these pieces of Singapore’s history are in good hands. This is awesome! I was searching for more information about these old school cake shops a while back, but didn’t find much. Thanks so much for this blog post. Gonna make time and check them out soon. Thanks Keax. Tell me when u check them out, and tell the bosses you are sent by Daniel’s Food Diary. haha. 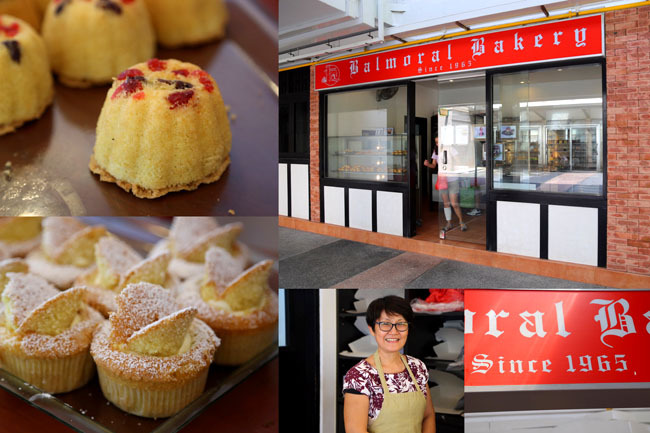 awwwww this brings back good memories – I grew up eating pastries and cakes from Balmoral Bakery the chicken pie and kaya cake are super yummy! I didn’t grow up eating them, but I am going to start. The pies are really heart-warming delicious. This is truly a good piece of work. Thank you for making the effort to uncover all these lovely food gems. All the best for the Singapore Blog Awards! Thanks George. Feel free to recommend if you have any food gems in your mind too. Cool, I’m gonna check out these old school cake shops! Thanks CK! Tweet me when you do mange to catch any of these shops. What a fun list… thanks for this! Perfect for a 60s themed party. ah! here is the post. Nice! Sembawang Confectionery has the best peanut cookies during CNY! My mum always buys tubs of their CNY goodies! 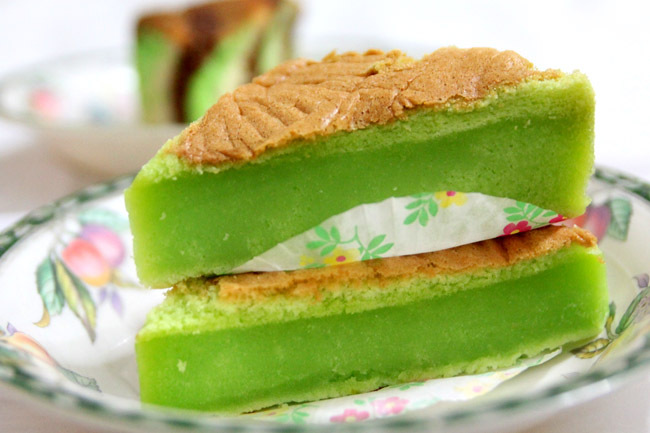 Also, where is the green kueh in your last photo from? & what is it called? Hi Shan, it’s a pandan cake from Ng Kim Lee at Chun Tin Road Upper Bt Timah (near Carpenter and Cook area). It’s also founded in the 60s, but didn’t include the shop as didn’t get a chance to talk to the boss. Very retro cakes there too! Great to see that there are a lot of old school places from the 1960’s that are still thriving today in Singapore. Long may they continue! I love the nine level kueh. Some paragraph spacing between each shop listing would be good for readers. Minimise confusion. Usually I do not learn article on blogs, however I wish to say that tis write-up very forced me to take a look at and do so! The cakes in Sembawang Confectionary reminds me of my childhood. When I was a kid, as long as I went to the town with my parents, I would ask for a small cake, which looks exactly like the ones in your blog. These cakes looks rustic, but the sweetness and happiness in them never changed. I've been down to Tiong Bahru Galicier today & is dissapointed that they have stopped making the pastry featured in the photo. Is there anywhere else we could find it dear? Wondering if you have checked out “Love Confectionery 爱的西果店” in Alexandra Village.. Old school bakery shop selling fabulous pandan cakes and butter cakes as well as a variety of breads. Hi Rebeccca, yes, I have checked them out. Though the uncle, when I visited, was not very open to interviews and photo-taking. Love this post. I remember there was a hainanese old -style kopitiam that serves coffee n cakes at Arab st next to zam zam. Was wondering if u had come across it in ur research.